Learn how to make a T-shirt quilt to turn a batch of unused (but much-loved) shirts into permanent memories. There are no special patterns for T-shirt quilts—they can be as basic or as intricate as you wish. Every quilt is unique and although specific T-shirt quilt patterns aren't necessary, it is true that assembly techniques are just a bit different for this type of project. 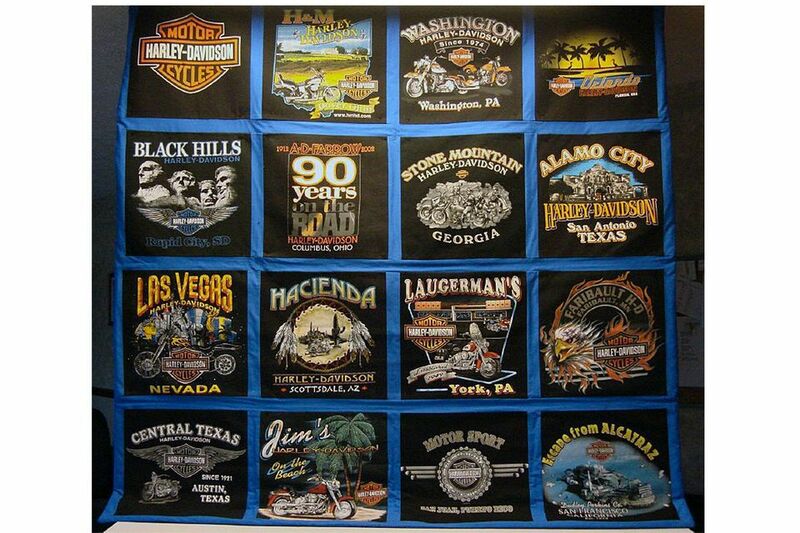 You'll see many examples of gorgeous quilts in our t-shirt quilts photo gallery. Examine the shirts you plan to use and ask yourself a few questions before you begin to make the quilt. How large are the T-shirts? How many shirts are available? Will all panels be cut the same size? Browse the gallery and you'll see that many quilters sewed panels of different sizes together in somewhat of a jigsaw-puzzle type layout. How large should the quilt be? Do you have enough shirts to make a quilt that size without adding other design elements? Do you want to use sashing between the T-shirt panels? Sashing, with or without cornerstones, helps separate the shirts and increases size. Borders can be added to increase size, too. T-shirts are much easier to work with when fusible interfacing is used to stabilize the stretchy fabric. Many brands are available but look for a non-woven fusible interfacing, such as Pellon Quilter's Grid 820. Your local quilt or fabric shop may have a non-woven version that's less expensive, and available by the yard. Ask what they keep on hand for T-shirt quilts. Be sure the interfacing comes with easy to understand instructions. A stabilizer is recommended but not everyone preps shirts with interfacing before sewing them into a quilt. The benefits of not using a stabilizer—a softer quilt top that's easier to hand quilt. The drawbacks—fabric that's more difficult to cut and sew accurately, and panels that may stretch over time if not secured to the batting and backing with fairly close quilting stitches. You may also experience puckering as the stretchy fabric folds onto itself during machine quilting. Use a pair of sharp scissors to remove the front panel, cutting near the side seams in order to leave as much fabric as possible—you'll trim back later. Cut off the sleeves and connecting seams. Cut below the neck banding, too, and remove any hemmed area along the bottom of the shirt. Don't remove too much excess fabric yet—oversize panels are good to have. After trimming, you'll likely have a somewhat rectangular panel. Do the same to the back of the shirt if its image will be used in the quilt. Cut all of the available shirts. The most simple quilts are created by sewing same-size shirt panels side-by-side. Multiply the finished width of panels by the number of panels per horizontal row to determine width (without extra elements such as sashing). Repeat to calculate the quilt's height. For instance: twelve panels that finish at 13" x 13" could be placed three rows across and four down to make a quilt that measures about 39" x 52". Use a design wall or other flat surface to experiment with quilts made from many panel sizes. Shuffle the panels around until the layout looks just right, and then sew panels together in sections, in columns or in rows. You will need to adjust the size of some panels to make this work. Are the panels about the same size, or do they vary? Do some designs take up a very large portion of their panels, and do others have more compact designs? If the scale of designs is a mix, are you okay with leaving excess 'blank' space around the smaller designs in order to make their panel sizes match the larger motifs? If the shirts are a mix of sizes, would you like to put them together in a random setting, such as Sherri's t-shirt quilt? If you have lots of shirts in different sizes, would it be better to make two quilts? Read the remaining instructions and then make a practice quilt sandwich from an unused shirt back cut into a couple of squares. Sandwich with batting and backing, baste and try your preferred method of quilting. Always start all machine quilting projects with a new machine sewing needle and adjust the sewing machine tension if necessary. Switch to a ballpoint needle, made especially for knits, if a typical machine needle snags the knit cloth (usually not necessary for stabilized t-shirts). When you're happy with results on the practice quilt, move on to complete the real thing. Interfacing is fused to oversize panels, which are then trimmed back to the correct unfinished size. T-shirt quilts are typically assembled with a 1/2" seam allowance, which is pressed open to reduce bulk. That means you should add 1" to the finished width and height of a panel to determine its unfinished size (the size to cut after fusing). Images can be centered within each panel or they can be offset—which would best suit your design? Make that decision before trimming any panel. Determine the cutting size for panels and then trim them to be somewhat larger, so that, when interfacing is fused to their backs, the final cuts will be along tightly-fused edges. For instance, if your T-shirt panels will finish at 12" x 12", leave the panel at about 14" x 14", and then trim back to 13" x 13" after fusing. A large square rotary ruler makes centering the design and cutting the panel a breeze. Make rigid templates of the sizes required if you do not have the rotary cutting equipment. A window template has an opening that allows you to easily mark both the cutting and sewing line while centering the image within the panel's finished dimensions. Remember to make the first cut larger than the panel's unfinished size, as explained above. Follow the manufacturer's instructions to fuse interfacing to the back of T-shirt panels. Be sure the interfacing is securely bonded to panel backs before trimming panels to their unfinished dimensions. The height of plain sashing strips used to separate T-shirt blocks should be the same height as the blocks. Sew the strips between blocks in individual rows. Plain sashing between rows of already-sashed panels can be measured and sewn using the same technique as for quilt borders. The sashing can be repeated as an inner border of the quilt—use the border instructions linked above to measure correct lengths. Sew to two opposite sides first, and then sew to remaining sides. If combining the T-shirts with other types of patchwork, it's okay to use a typical 1/4" seam allowance (consider the reduction when determining how large to cut the shirt panels). On point, quilt layouts are more challenging for T-shirt quilts since it's often difficult to leave an adequate seam allowance around typical motifs. Browse the gallery to see how quilters used sashing and borders in their quilts. Some added blocks created by printing a design on fabric, and many added buttons or other embellishments. After the quilt top is complete, finishing the quilt is really no different than finishing any other quilting project, although it's easier to machine quilt a T-shirt project than to quilt it by hand. Use a 1/2" seam allowance to sew panels in each row or column together. Press seam allowances open and then join the rows or columns, matching intersections where seams meet if necessary for the design. Square up edges if necessary. Outer panels may seem a tiny bit off if you apply binding with a 1/4" wide seam allowance because cutting dimensions allowed a larger seam. The small difference probably won't be noticeable, but use a 1/2" seam to bind if you wish. ​If mitering corners and using a 1/2" seam allowance, stop and miter 1/2" before you reach each corner—​not 1/4" before the corner. The quilt binding instructions explain. You could also carefully remove the extra 1/4" seam allowance that encircles the quilt, and then sew the binding on with a 1/4" seam. If you don't quilt at all, consider sending the quilt top to a longarm quilter. Use a search engine to search the term: longarm quilters, and tack on your city or state after the term. You'll likely find many, and if you don't, call a local quilt shop because staff can usually offer recommendations. Talk to the longarm quilter before you begin working on the project, to make sure it's constructed in a way she or he can easily quilt.